UBC’s CIRS: A truly green building! 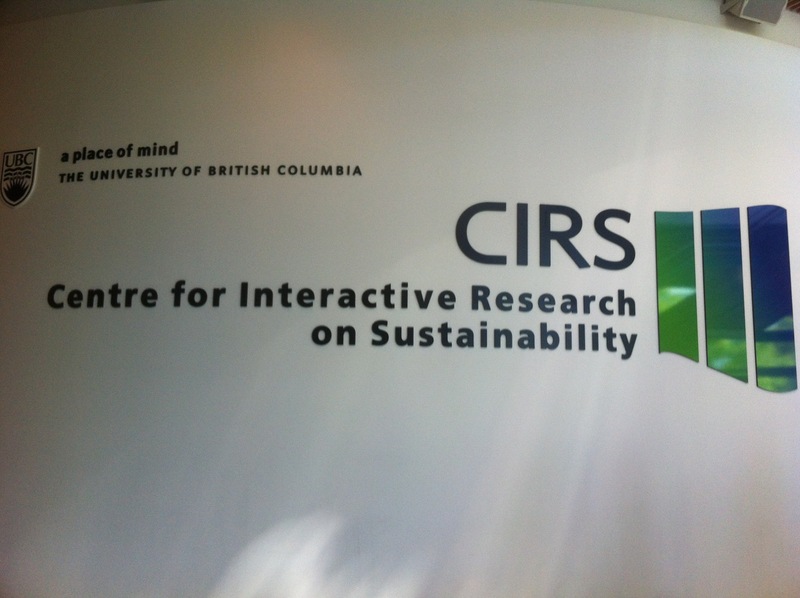 UBC’s new Centre for Interactive Research on Sustainability (CIRS) should not only be a place where students are taught sustainability but also a living laboratory for sustainability. During yesterday’s green walk through the building I got an amazing insight into what a truly green building can look like. 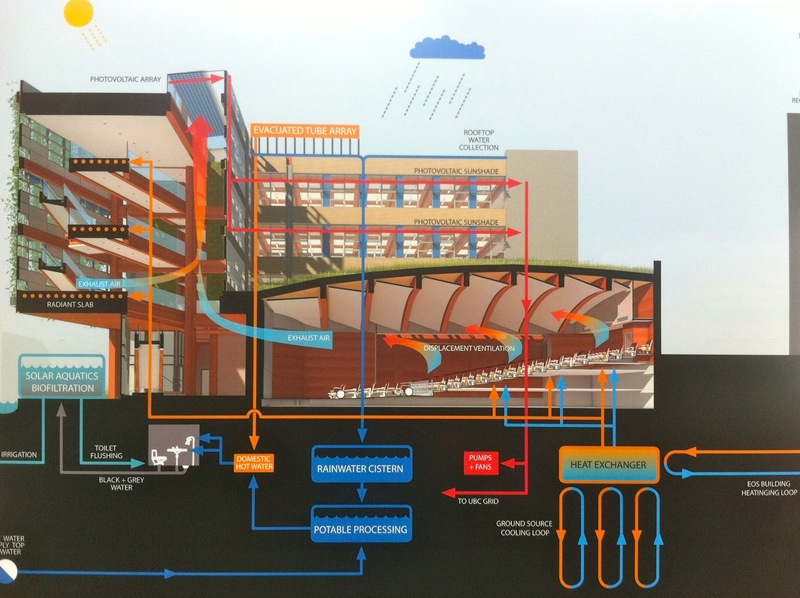 And, actually also into what every new building should nowadays look like if we truly embrace the concept of sustainability in building and design. 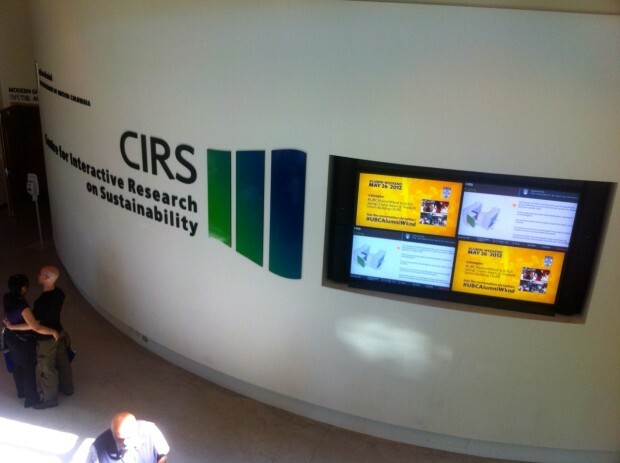 The CIRS, a $37-million laboratory which was opened in November 2011, is the greenest building in North America. It only cost 22% more than a comparable “regular” building and should payoff within several years. As I have already written in my blogpost on the “Next generation sustainability” panel discussion, the CIRS is net positive on energy (creating renewable and waste energy for itself and other buildings), water quality (treating rainwater to be used as drinking water for students and other uses), structural carbon (locking carbon into the building’s structure by using wood as a main building material) and operational carbon emissions (needing no fossil fuels). Moreover, it is also regenerative in human terms as its design should increase the productivity, health and happiness and foster collaboration between researchers, operational staff, students and external partners who should spread sustainable ideas throughout the world and become agents of change. In the following, I would like to show you some of the highlights of yesterday’s green walk (click on images to view in larger size). UBC’s CIRS has a solar aquatics biofilter for the treatment of wastewater next to its main entrance. 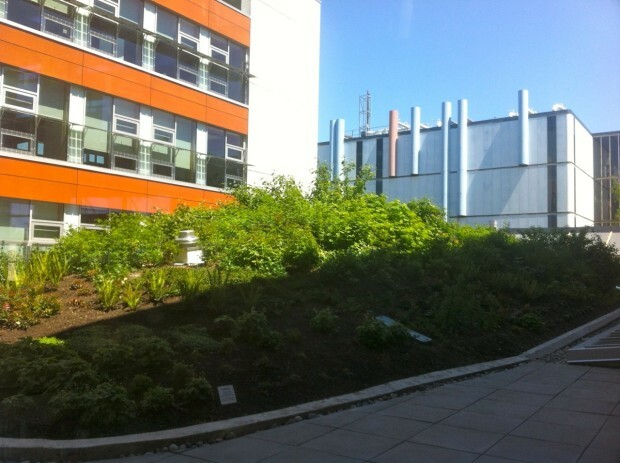 The living plants in front of the windows help cool the building in summer and allow sunlight in winter. Moreover, the windows have temperature sensors and open and close automatically to ensure energy efficiency. 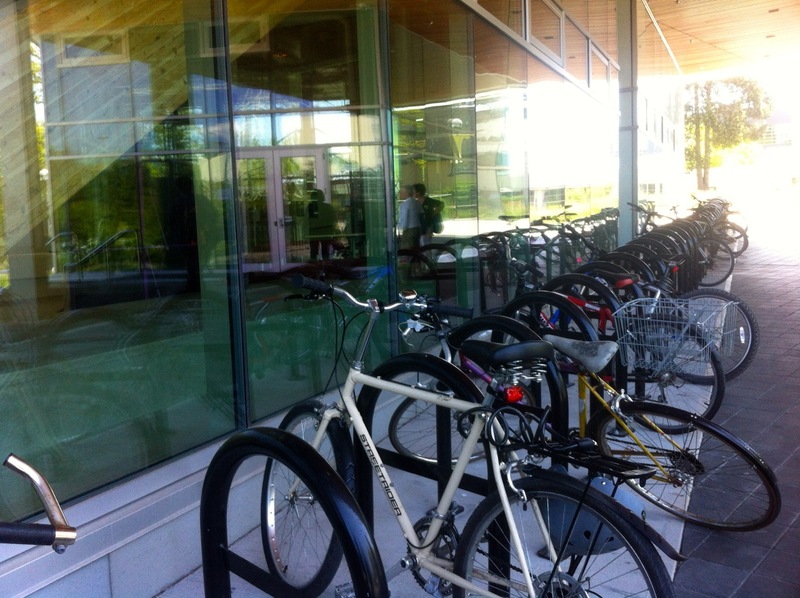 Bike racks in front of the building should encourage students to use their bikes on the campus. The building is net positive on energy, water quality and carbon. 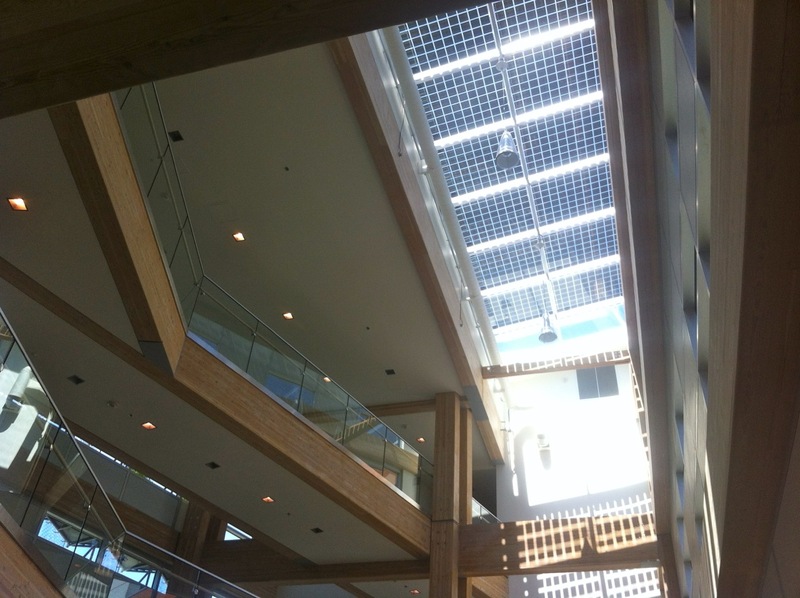 The energy-efficient building makes use of rainwater, wastewater, solar energy and geothermal energy and powers and heats itself as well as other buildings on the campus. 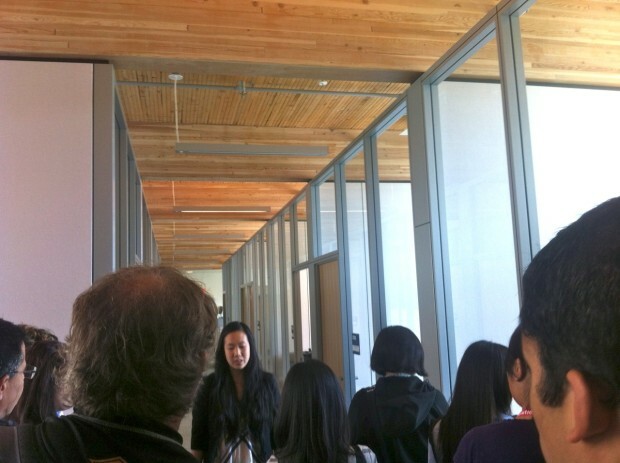 The interior is characterized by a lot of natural sunlight and wood as a main building material that captures carbon. Moreover, photovoltaic solar panels are installed on its roof. 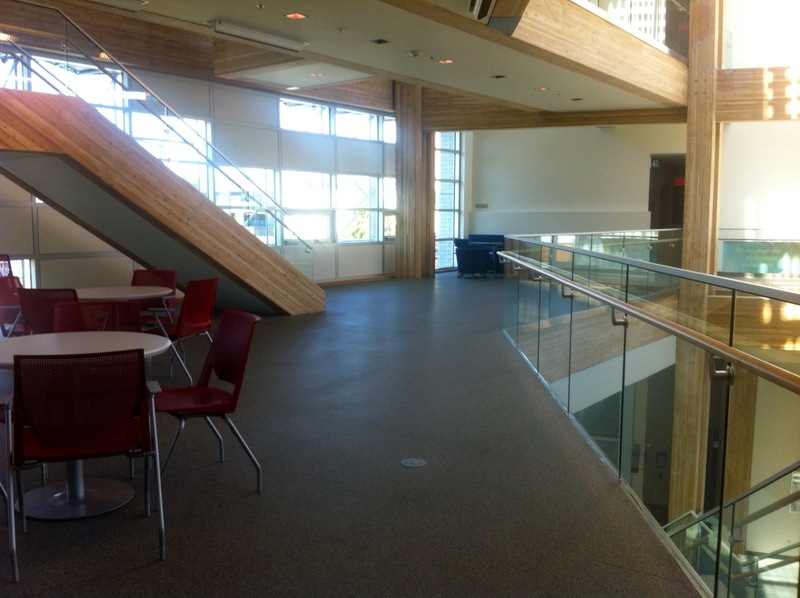 Open spaces should encourage discussion and collaboration. 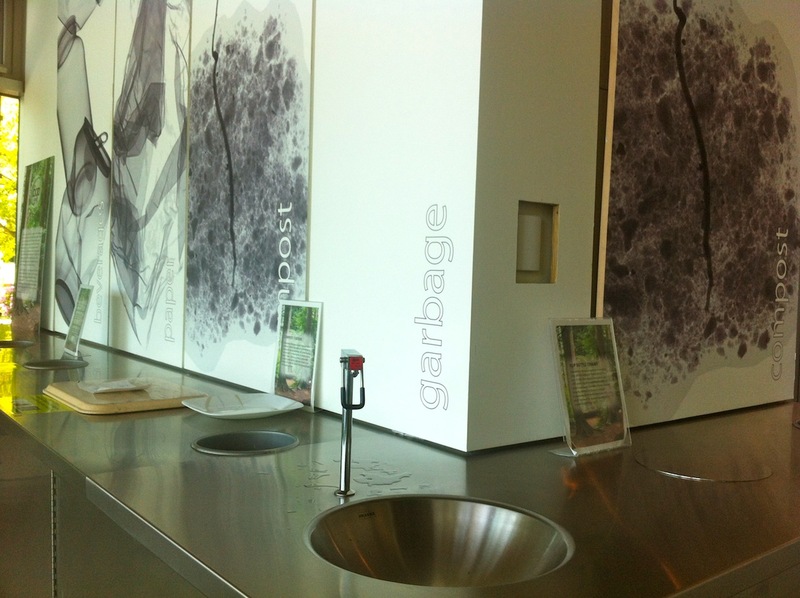 The floors are made of recycled rubber. 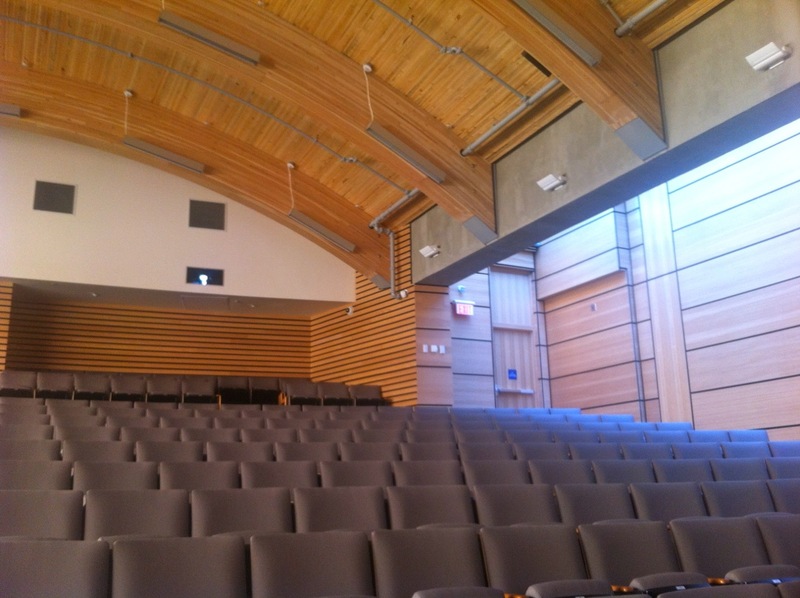 The Modern Green Development Auditorium also features bright sunlight and wood. There are also a lot of courses for students of non-sustainability courses to inspire them. A small roof garden attracts various species and creates enjoyable space. 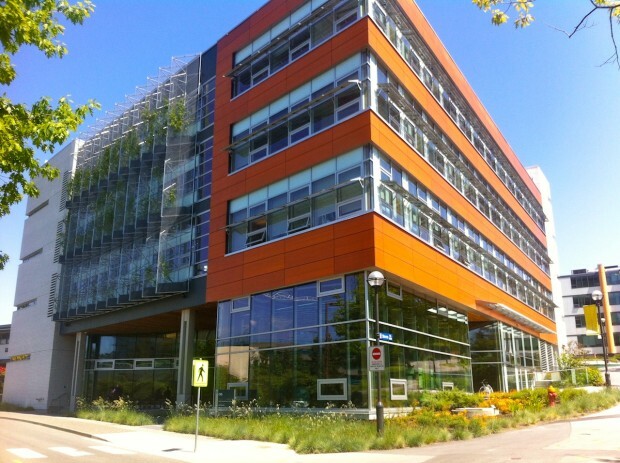 The green offices have bright sunlight and moveable walls to quickly remove or create new spaces. The giant screens collect data and show the building’s current energy use, temperature and other statistics and information. They act as information and communication tools and should also enable behavioral change. CIRS’s green café only uses compostable material (including takeout containers), doesn’t offer any plastic-bottled drinks, has a broad range of fresh, vegetarian and organic food (also featuring a meatless Monday) and sources sustainably. In fact, you even stir your coffee and tea with dry linguine which composts faster than wooden stir sticks. Andreas Lindinger is a Vienna-based business consultant, sustainability expert and urban thinker passionate about livable cities, sustainable transportation, renewable energy and civic engagement. Andreas offers a transdisciplinary business, finance and sustainability background, industry expertise in energy, mobility and environmental consulting and broad international experience gained in Vienna, Vancouver, Berlin and Dublin. Make sure to also check out Vienncouver.com and to follow @lindinger on Twitter.